For readers of Epoxyworks, the name Hot Canary should ring a bell. Constructed in 2011 by an employee team at Gougeon Brothers, Inc., she was built as a winning platform for the Everglades Challenge. Having completed several of these self-supported, expedition races, and with the sad passing of Jan Gougeon, the highly customized i550 Hot Canary was listed for sale, ready for new adventures. My wife Rachel and I had been searching for the “perfect” first boat since early 2016. Along the way, I discovered and fell in love with the i550, but had always told my wife to never, ever let me build a boat. After watching the time lapse of one being built (coincidentally, it was Hot Canary), I actually needed very little convincing to not build one. So now what? Well, the next step seemed clear after I discovered that the venerable Hot Canary was actually for sale. Logistically, purchasing Hot Canary didn’t make a ton of sense. She was languishing under the Florida sun and had been listed for nearly a year. Something was probably wrong with her, and even if she was in great shape, how would we get her back to Michigan? Figuring we would sort out these details later, we wrote a heartfelt, personal letter to Meade Gougeon, and made an offer on the boat. Amazingly, he accepted and we suddenly found ourselves the new owners of a ridiculously awesome little boat. Vivacious in her former life as Hot Canary, with Jan Gougeon at the helm. I flew down for a quick survey (which I performed) and prepared the boat for the 1,300-mile journey. Using an eBay®-like website called uShipTM, we arranged for a truck to trailer her north. I breathed a huge sigh of relief when I saw her pale yellow hull being backed into our driveway. She had made it back to her Michigan roots. Having arrived in October, we had time for a single test sail on a blustery fall day in Muskegon, Michigan. Our death roll under spinnaker proved that the boat had a steep learning curve, but we were head over heels for this little sportboat. 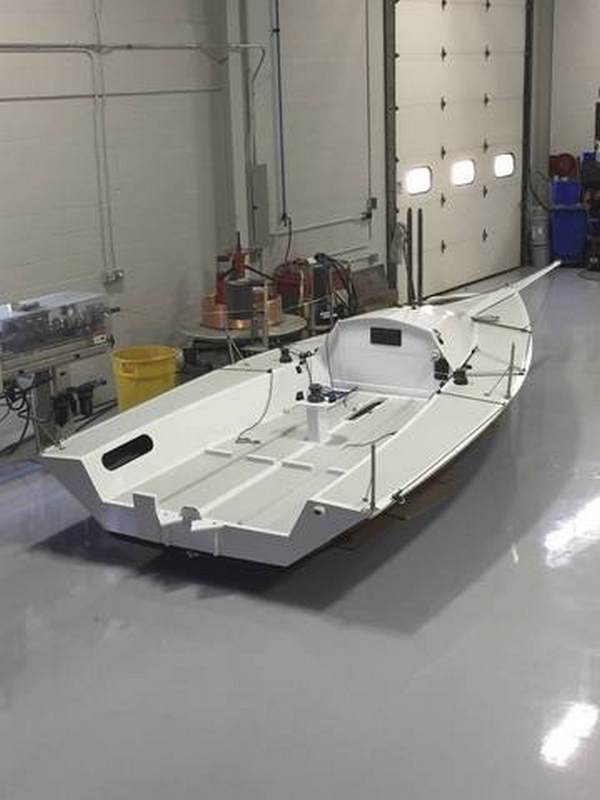 To make the boat our own, we committed to an off-season refit with fresh paint and new non-skid. We had some great warehouse space available, so the boat was moved there. The first step was to remove all of the deck hardware so it would be easy to sand. Having been built by the gurus at Gougeon Brothers, everything was bedded in epoxy, so a soldering gun was used to heat the fasteners and break the tenacious bond. The four stanchion bases were especially hard to break free, but we eventually had all of the hardware removed, bagged, and labeled. Numerous photos were taken so we could remember how it went back together. At some point in her illustrious racing career, Hot Canary had taken a pounding on a Florida beach, so we began by filling and fairing dozens of small chips in the deck and hull. Taking advantage of several sunny spring days, we moved the boat outside and sanded her down. What a loud, messy job. 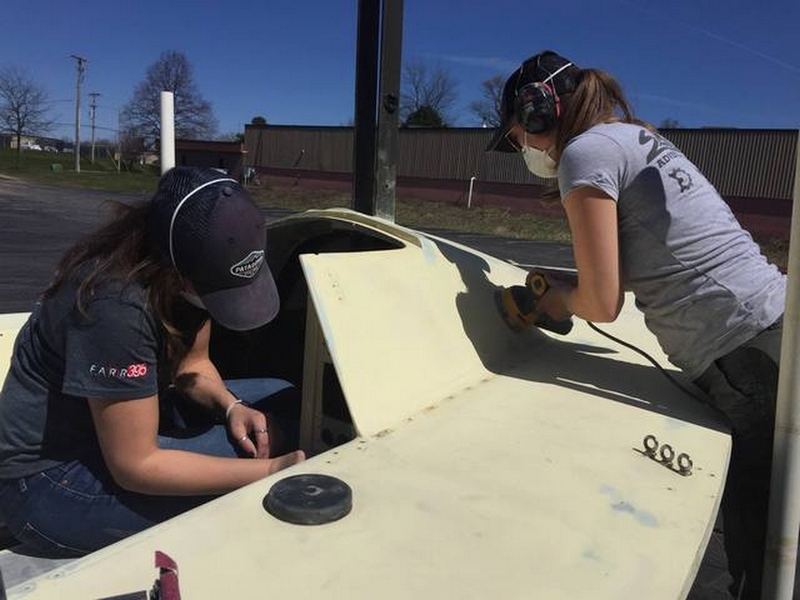 The non-skid was removed with 60-grit paper and the entire hull was sanded with 150-grit. Back indoors, we flipped the boat over so we could sand the bottom. Enjoying a sunny spring day while preparing the boat for paint. We removed the old bottom paint using a random orbital sander and 80-grit, then filled various dings with WEST SYSTEM Six10 Thickened Epoxy Adhesive. It was a little harder to fair, but I felt more confident with the WEST SYSTEM product below the waterline. With the boat completely sanded, faired, and wiped down, it was finally time to paint. She was previously painted with Interlux® Perfection®, but in order to save some money, we decided to coat her with Interlux Brightsides®. I had read good things about the ease of application, and it was about half the price of Perfection. (Hindsight being 20-20, it was a mistake to be cheap on painting supplies when we invested so much time in the preparation). The technical folks at Interlux said we could paint directly over the old Perfection finish, so we rolled and tipped on Brightsides paint with acceptable results. With one person rolling and the other brushing, Rachel and I could add a coat of paint in about an hour. We discovered that our felt rollers were leaving hairs behind, so we switched to cabinet style foam rollers with much better results. Sanding between coats, we built up a quality finish in a lovely color called Ocean Blue. Four coats required two quarts of paint. 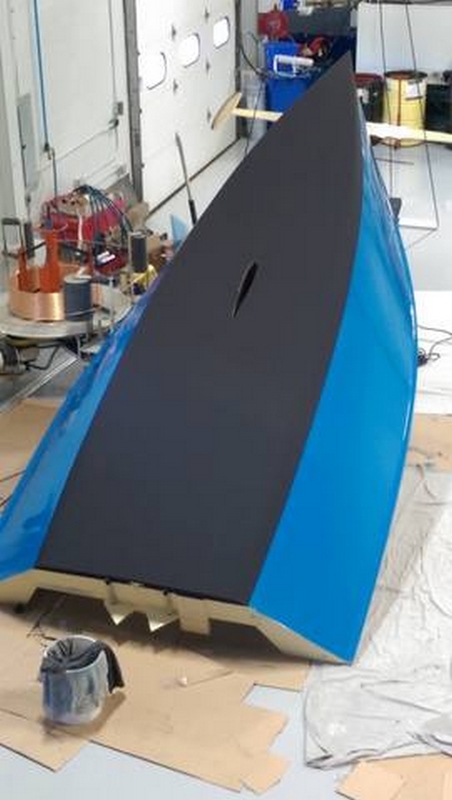 The first coat of blue hull paint in the transformation from Hot Canary to Vivacious. 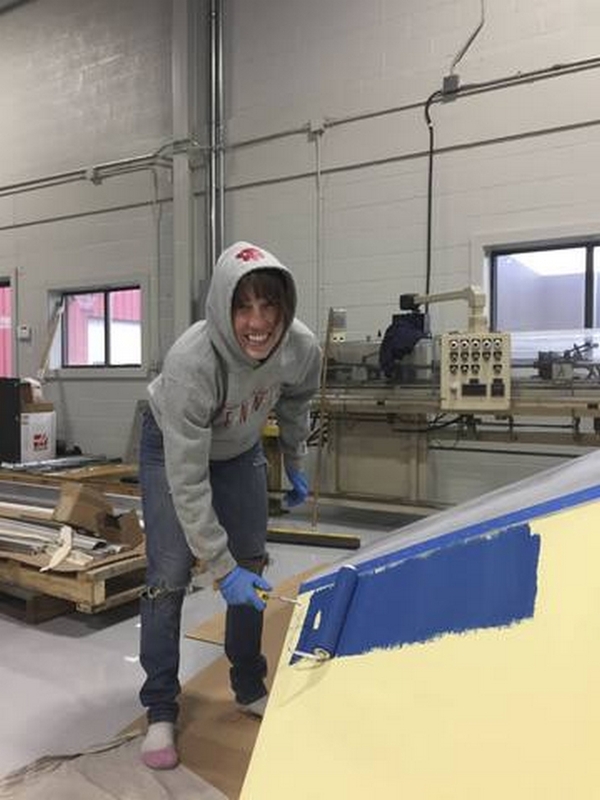 With the hull painted, it was time to roll the boat over and paint the rest of the boat. With the beautiful blue hull complete, we taped the waterline and painted the bottom with “environmentally friendly” Pettit® Hydrocoat™. Simply rolling on the bottom paint yielded a surprisingly good finish. At this point, we started to see the rewards of all the sanding and prep work. Finally ready to paint the rest of the boat, we carefully flipped her back over. A couple of forklifts made this precarious job easier. The entire deck was coated in Interlux PreKote® primer to ensure that these high-use areas would be especially durable. I always thought gray non-skid and white cabin tops looked classy, so that is what we decided on. We painted the white areas first so we could then overlap the gray non-skid. This allowed us to tape the non-skid areas only once. Three coats of white Brightsides paint were applied, with sanding between each coat. Taping the non-skid areas on the deck and in the cockpit was time-consuming, but the radiused corners added a custom touch. To keep things simple, we used different tape widths to offset the edges. While our first coat of gray was still wet, we used a salt shaker to apply the Pettit® Specialty 9900 Skidless Compound (basically, a fine silica). It took a bit of practice to apply this consistently, but it worked well enough. Returning the following day, I realized we were going to have a very aggressive non-skid unless we built up some more layers of paint. Interlux Brightsides is a high-gloss polyurethane paint, and when combined with the non-skid, it really highlighted the inconsistencies of the silica application. Somebody suggested adding a flattening agent, so the next two coats were significantly flattened. This proved to be a great solution. Non-skid painted and deck hardware reinstalled. Finally seeing the light at the end of the refit tunnel, we bribed some friends with pizza and beer to help us reinstall the deck hardware. Once again, the Six10 Epoxy came in handy as we mixed small batches on a piece of cardboard and went around bedding the new fasteners. The Gougeon Brothers on Boat Construction book provided great instruction for these steps. Just for the heck of it, we used a pallet jack scale to weigh the empty hull. She tipped the scale at only 471 lbs. 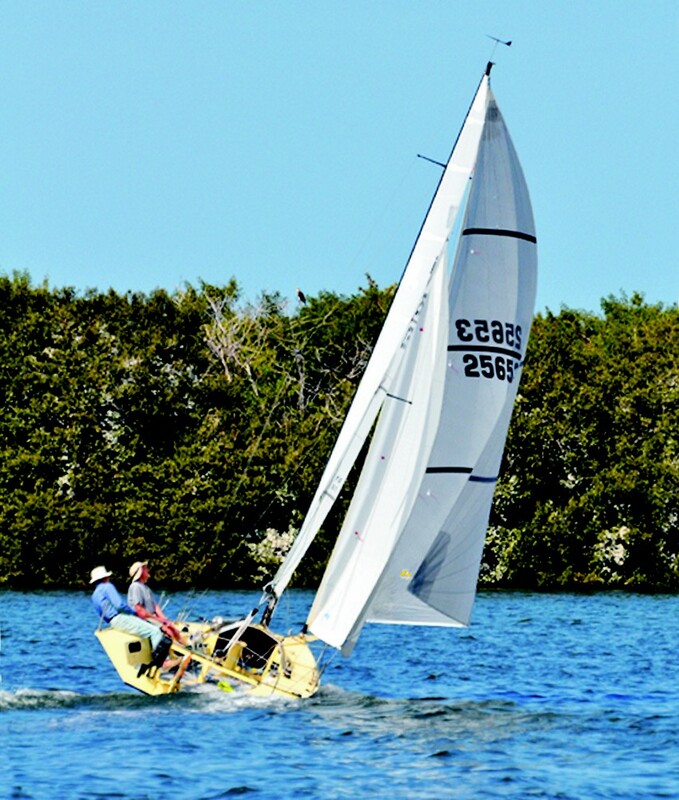 With the 180 lb keel, rudder, and running/standing rigging, that put the complete boat at a little over 700 lbs. Class displacement is 800 lbs, so the Gougeon team definitely did something right. The final step in our refit was to paint the keel and rudder “distress orange.” I’ve always liked the look of bright foils, and it would be a good safety feature if we ever capsized. In honor of her spirited and lively manner, we renamed her Vivacious, although we affectionately call her Viv for short. She has already proved herself on an 8-day camp-cruising trip through the North Channel. 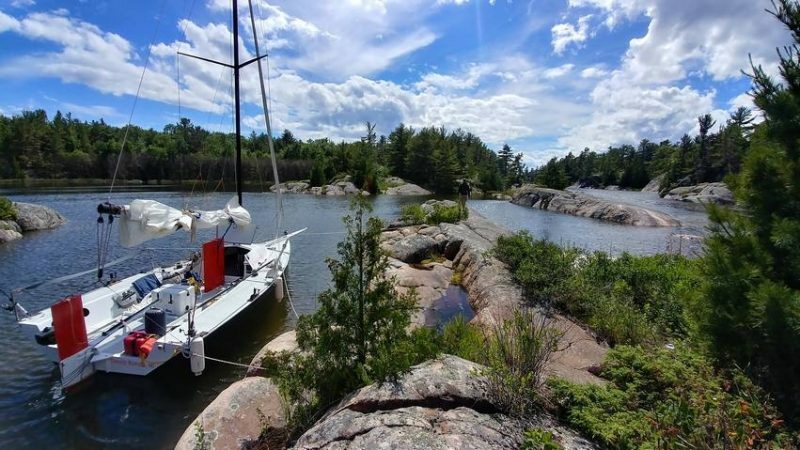 And we intend to explore Beaver Island this summer, and enjoy some fast, downwind sails on Lake Michigan. Even with her new name and colors, we are amazed by the number of people who recognize and know her as Hot Canary. We’re honored and excited to be a part of this boat’s story, and we look forward to the coming years of small boat adventures. This entry was posted in Boat Repair, Wooden Boat Repair and tagged #45, Alex Boelkins, Epoxyworks 45, i550, sportboat on September 13, 2017 by ewadmin.